Before we move on to this week's review and outlook, I want to address a small factor in silver and gold's trade that I've written about in the past, but haven't mentioned much of it lately. What I'm talking about is 'who's leading who', it is common knowledge among those who follow gold and silver that silver usually leads gold in their short-term trade. However, this year's been different, gold has been repeatedly moved ahead of silver, mostly when it's moving up, in the short-term trade. Although I stopped writing about the trading movement, I continued to show 'who was leading who' in the 'Title Graphic' of each blog post since May 1st. 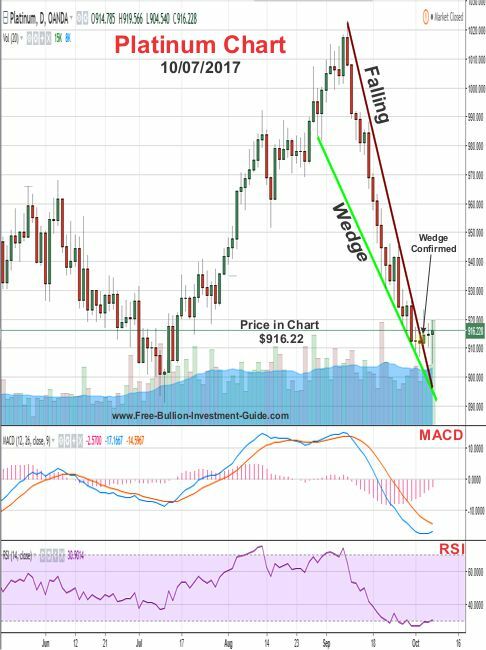 In each 'title graphic' of this blog (seen here), you'll notice that silver is leading gold to the downside and gold is leading silver to the upside, all that changed this week when silver turned up faster than gold. The significance of this isn't quite clear at this point, but I'll let you know if anything becomes of it or if it changes. The change in silver's trade has been represented in the graphic above. 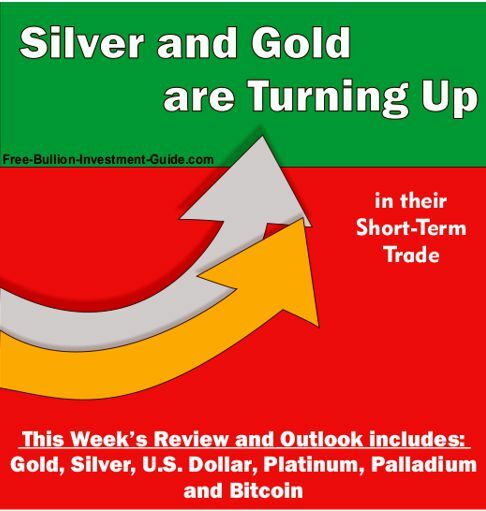 This week's review and outlook includes Gold, Silver, U.S. Dollar, Platinum, Palladium, and Bitcoin. 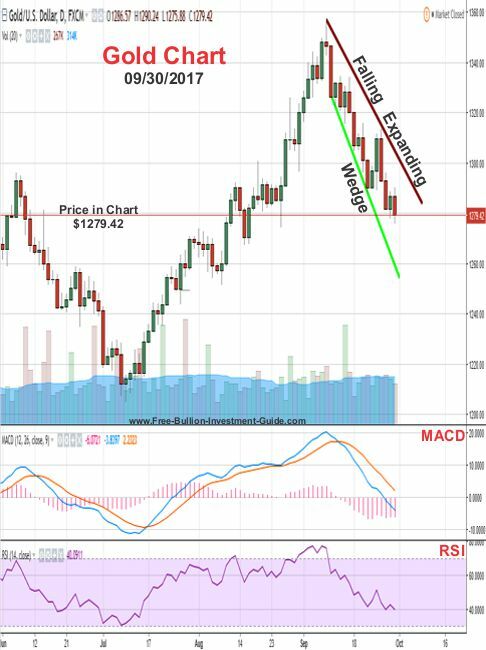 As you can see in the chart below, we saw some consolidation most of the last week, then on Friday, after the dismal jobs report, silver broke the upper falling trend-line of the 'Falling Expanding Wedge' confirming the pattern. 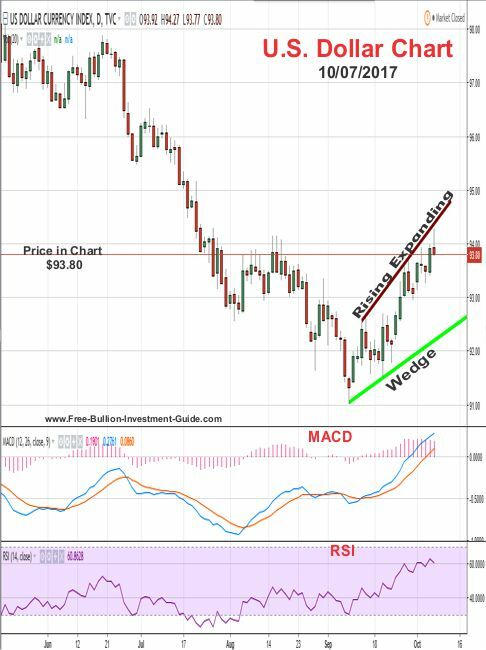 In the week to come, silver should continue to turn up in price, both of its lower indicators (RSI & MACD) are agreeing that this should happen. 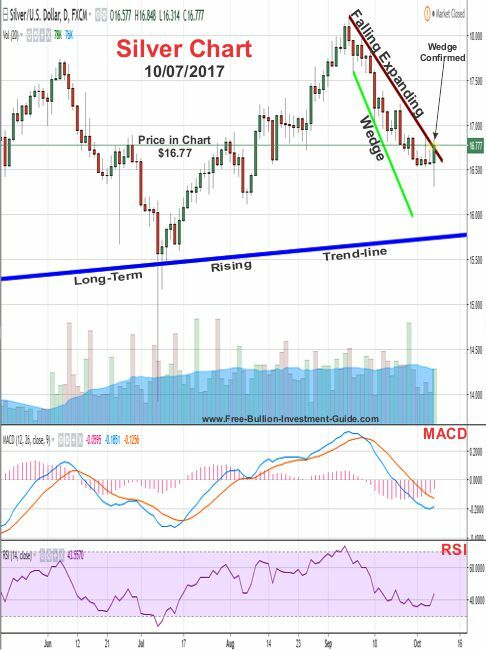 In addition, although we may see the price rise this week, technically we'll also probably see the price of silver consolidate around the $16.95 to $17.15 level. 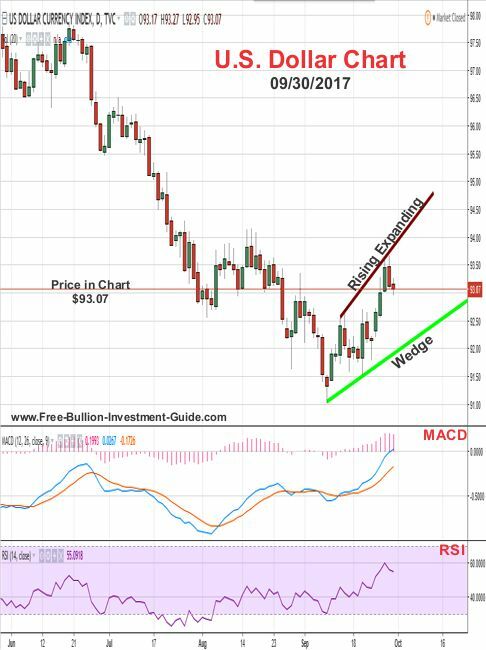 However, fundamentally, tensions with North Korea are back on the rise, so the price of silver (and gold) may break through its resistant levels in the week to come. "...a 'Falling Expanding Wedge' has formed in gold's price chart, this is a positive sign for gold. In the chart below, you can see that last week the price of gold fell a little, but it mostly moved sideways. 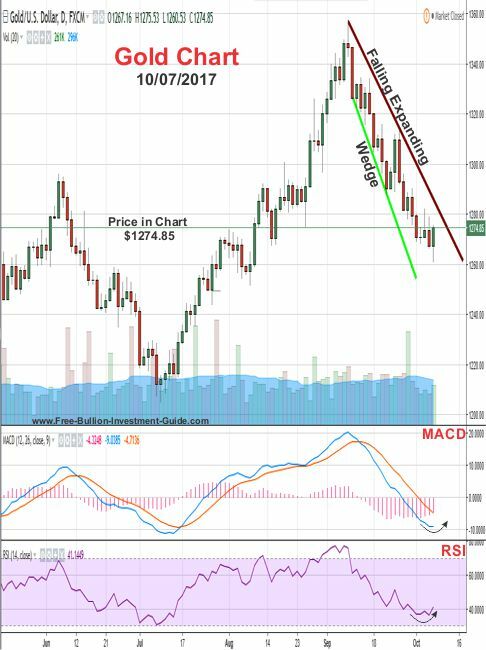 For the week to come, like silver, gold's MACD and RSI are both indicating that the price of gold should start to turn up at the beginning of next week. As gold rises it will most likely start hit resistance between $1290 - $1310, so we should see some consolidation at this level. Unless the tensions between the United States and North Korea escalates again, or some other unforeseen act happens then we may see the safe haven continually rise throughout the week. Time will tell. In the chart below, you can see that the U.S. Dollar's pullback didn't last very long, instead, it has continued to move up, but it has done so inside the negative 'Rising Expanding Wedge' pattern. For the week to come, nothing new has shown up on the chart. The negative 'Rising Expanding Wedge' is still looming over the dollar so sometime this week we should see the price of the dollar start to retreat. 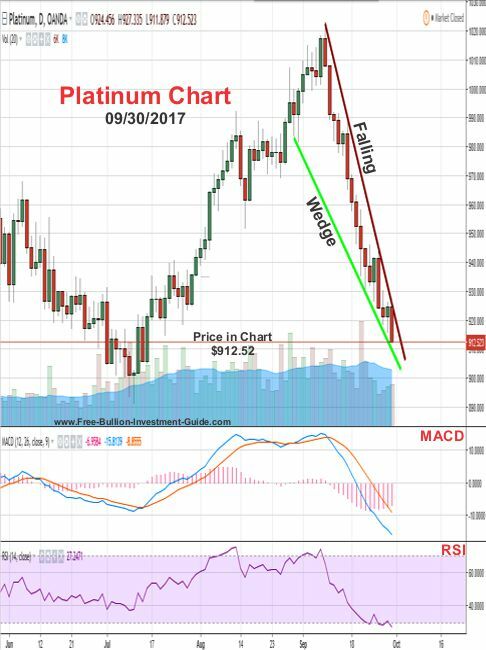 Below is the outlook chart and commentary from the Platinum section in last week. In the chart below, platinum did stop falling and broke out of the 'Falling Wedge' pattern, confirming it. For the week ahead, no new pattern has taken any definitive shape in Platinum's price chart. However, like gold and silver, its MACD and RSI (lower indicators) are showing that the price should turn up this week. Last week's assessment that palladium wasn't showing any clear direction in how it would move, turned out to be true. 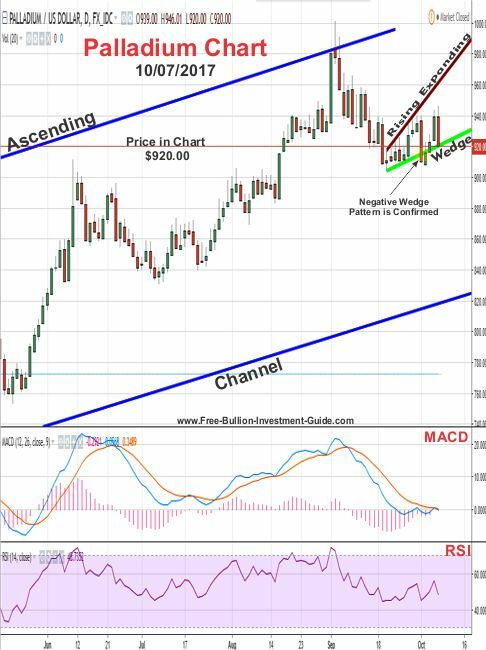 Palladium started last week by confirming the 'Rising Expanding Wedge,' then after it fell through it, its price popped back up, only to end the week down again. 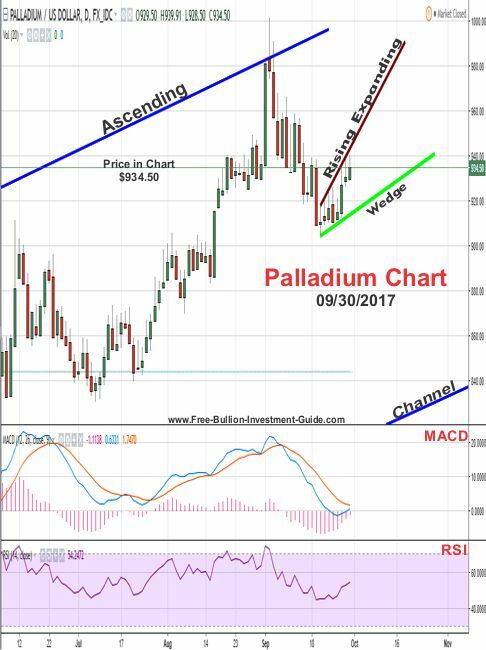 For the week to come, no clear patterns have formed in Palladium's chart since its erratic movements from last week. 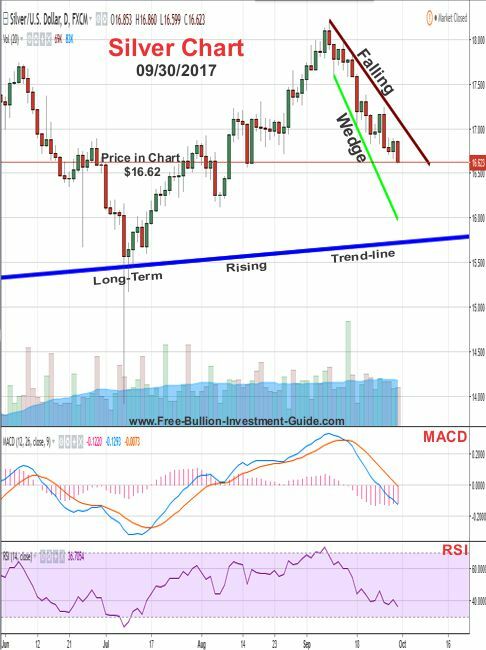 In addition, no clear direction can be detected from Palladium bottom indicators (MACD & RSI), so we may see this week more of the same sideways movement that we saw last week. Time will tell. In the bullion industry, you'll find some that love bitcoin and you'll find some that hate it; I'm indifferent to it. I see it as a unit of exchange if it fails; "so be it," and if it doesn't, "ok."
However, I don't think it shouldn't be overlooked. So as for those who follow this blog you know that since July at the end of each blog post I've been analyzing assets that relate to the precious metals market. Bitcoin relates mostly to the precious metals as a safe haven, but to be honest, it has many similarities and it has many differences, but that's a discussion for another day, so let's take a look at the daily chart below. 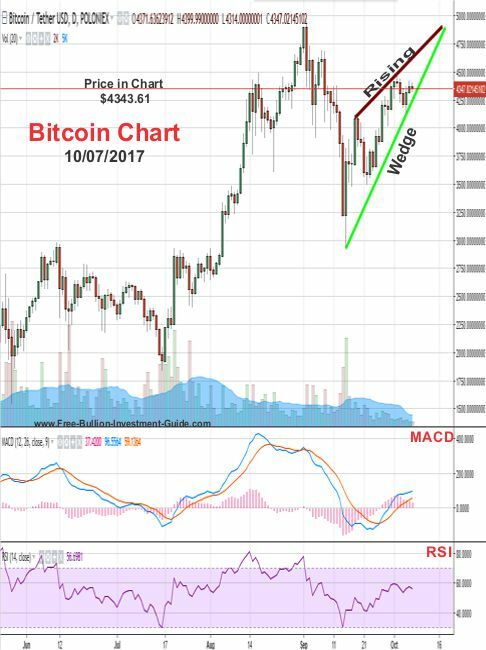 In the Bitcoin chart, a negative 'Rising Wedge' pattern has formed. Its hard to say when the pattern will play itself out, but I'll update you when it does. Full disclosure: I own some crypto-currencies, but I do not currently own bitcoin. On October 2nd Tom Petty passed away. I've been a fan of Tom Petty since the mid-80's, but I never really had a favorite song because I liked them all. Rest in Peace Tom Petty and Thank you for all the great songs.